As fall is almost here, I'm loving all the heartier foods available on local menus. I noticed this lovely veggie option available today at Astor Bake Shop, which made me hungry. 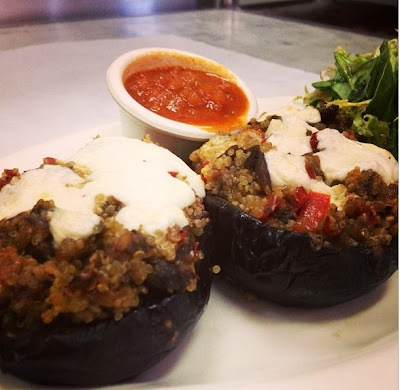 Check out this beautiful stuffed baby eggplant, featuring quinoa, red pepper, onion and mozzarella cheese. In case this doesn't whet your appetite, there's always their signature burger, which comes on a fluffy brioche bun and can be topped with your choice cheese and bacon. The latter is deliciously thick, lean and smoky - I highly recommend it. It behooves you to get a seasonal dessert too such as their fruit and nut tarts and pumpkin desserts. Rumor has it that they've got a lot of other seasonal sweets and drinks in stock. Hope you enjoy your visit.